I’ve kind of been out of my crafting mojo recently. I feel back in the swing of things this weekend and my first crafty stop was to the Colour Me…! Challenge Blog for a kickstart. This week, The CMCC#40 is to create a project using only neutral colours and coral. As I normally do, I started in Silhouette Studio and cut the grey stitched background and the vanilla banner (it has stitching as well but the camera couldn’t pick it up). Using three different snow flake stamps from the Lawn Fawn Deck the Halls set, I stamped the snowflakes with Versa Mark ink and then heat embossed with a white pearl powder. I used a piece of heavy weight vanilla cardstock for the card base and then cut a piece of the same cardstock to stamp and colour my sparrows. I am brand new to colouring with alcohol markers and purchased the Bic Mark-it markers to get my feet wet. These markers are inexpensive and come in 36 colours. Not all of them are very good at blending, but some do a pretty good job and they all have the cutest names! I don’t have a black ink that’s ideal for stamping the images I was going to colour, so I used a black pigment ink and embossed with Super Fine clear. The embossing really helped the ink stay put. The sparrows are stamped from Lawn Fawn Winter Sparrows set and coloured in with Peach Parfait, and Pink Flamingo markers. For the accessories, I used Cloud Nine Grey, and for the beaks I used Tiki Hut Tan. To create the branches, I stamped first with Gathered Twigs Distress Ink and then again with SSS Khaki ink to add some shading and dimension. Both Lawn Fawn sets I’m using come with a branch stamp. To finish the branches I used Glossy Accents, spreading it irregularly to add some ‘branchy’ texture. While I had it out, I added some Glossy Accents to the beaks. I stamped the sentiment from the Deck the Halls set onto my banner and then used some grey string and three tiny stitches to attach the banner to the grey background. I used a Micro Glue Dot to stick down the other end of the banner and curled the tips to create a little dimension. 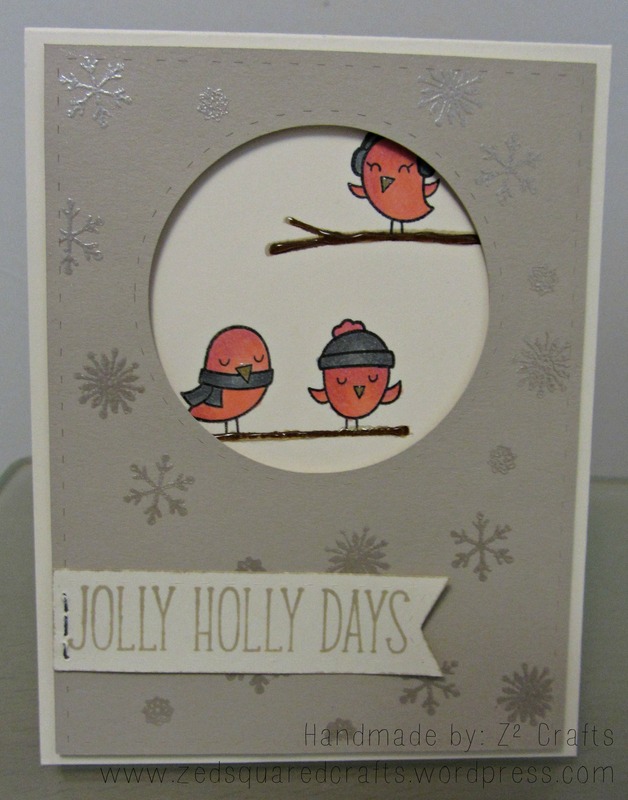 To finish the card, I positioned my sparrows on the card base and adhered them down using my tape runner then used foam tape on the grey background and positioned it in place. There you have it, my first ever attempt at colouring with alcohol markers! I look forward to playing around with these markers in many projects to come! Love those cute little birdies all dressed for winter! Thanks for joining us for our monochromatic challenge over at Colour Me…! this week.